↑ ক খ David Murphy, (Illustrated by Peter Dennis), The Arab Revolt 1916-18: Lawrence Sets Arabia Ablaze, Osprey Publishing, 2008, p. 26. ↑ Military Intelligence and the Arab Revolt: The first modern intelligence war, Polly a. Mohs, আইএসবিএন ১-১৩৪-১৯২৫৪-১, Routledge, page 41. 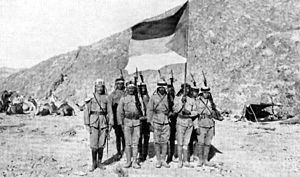 ↑ ক খ গ ঘ ঙ চ Murphy, David The Arab Revolt 1916-1918, London: Osprey, 2008 page 34. ↑ Murphy, David The Arab Revolt 1916-1918, London: Osprey, 2008 pages 20-21. 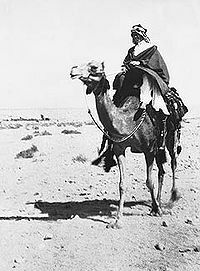 ↑ Murphy, David The Arab Revolt 1916-1918, London: Osprey, 2008 pages 20–23. ↑ ক খ Murphy, David The Arab Revolt 1916-1918, London: Osprey, 2008 page 21. ↑ ক খ গ ঘ ঙ চ ছ জ Murphy, David The Arab Revolt 1916-1918, London: Osprey, 2008 page 24. ↑ Murphy, David The Arab Revolt 1916-1918, London: Osprey, 2008 pages 21-22. ↑ ক খ Murphy, David The Arab Revolt 1916-1918, London: Osprey, 2008 page 23. ↑ Murphy, David The Arab Revolt 1916-1918, London: Osprey, 2008 page 15. ↑ Murphy, David The Arab Revolt 1916-1918, London: Osprey, 2008 page 8. ↑ Murphy, David The Arab Revolt 1916-1918, London: Osprey, 2008 pages 34-35. ↑ Murphy, David The Arab Revolt 1916-1918, London: Osprey, 2008 pages 33-34. ↑ ক খ Murphy, David The Arab Revolt 1916-1918, London: Osprey, 2008 page 35. ↑ ক খ গ ঘ ঙ চ ছ Murphy, David The Arab Revolt 1916-1918, London: Osprey, 2008 page 17. 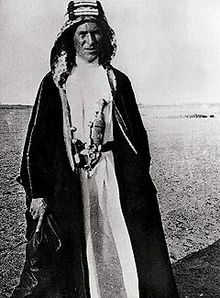 ↑ Wallach, Janet Desert Queen The Extraordinary Life of Gertrude Bell Adventurer, Adviser to Kings, Ally of Lawrence of Arabia, London: Phoenix/Orion Books Ltd, 1997 pages 25, 115–8, 202. ↑ ক খ Murphy, David The Arab Revolt 1916-1918, London: Osprey, 2008 page 36. ↑ Murphy, David The Arab Revolt 1916-1918, London: Osprey, 2008 page 13. ↑ ক খ গ Murphy, David The Arab Revolt 1916-1918, London: Osprey, 2008 page 37. ↑ ক খ গ Murphy, David The Arab Revolt 1916-1918, London: Osprey, 2008 page 38. ↑ Murphy, David The Arab Revolt 1916-1918, London: Osprey, 2008 pages 14-15. ↑ ক খ Murphy, David The Arab Revolt 1916-1918, London: Osprey, 2008 pages 39-43. ↑ ক খ Murphy, David The Arab Revolt 1916-1918, London: Osprey, 2008 page 43. ↑ ক খ Murphy, David The Arab Revolt 1916-1918, London: Osprey, 2008 pages 43-44. ↑ ক খ Murphy, David The Arab Revolt 1916-1918, London: Osprey, 2008 page 44. ↑ Murphy, David The Arab Revolt 1916-1918, London: Osprey, 2008 page 45. ↑ Murphy, David The Arab Revolt 1916-1918, London: Osprey, 2008 pages 56-57. ↑ Murphy, David The Arab Revolt 1916-1918, London: Osprey, 2008 pages 57-59. ↑ ক খ গ Murphy, David The Arab Revolt 1916-1918, London: Osprey, 2008 page 59. ↑ Murphy, David The Arab Revolt 1916-1918, London: Osprey, 2008 pages 59-60. ↑ ক খ Murphy, David The Arab Revolt 1916-1918, London: Osprey, 2008 page 81. ↑ Murphy, David The Arab Revolt 1916-1918, London: Osprey, 2008 pages 39-46. ↑ Murphy, David The Arab Revolt 1916-1918, London: Osprey, 2008 pages 64-68. ↑ Murphy, David The Arab Revolt 1916-1918, London: Osprey, 2008 pages 68-73. ↑ ক খ Murphy, David The Arab Revolt 1916-1918, London: Osprey, 2008 page 73. ↑ Murphy, David The Arab Revolt 1916-1918, London: Osprey, 2008 pages 73-74. ↑ Murphy, David The Arab Revolt 1916-1918, London: Osprey, 2008 pages 70-72 & 75. ↑ Murphy, David The Arab Revolt 1916-1918, London: Osprey, 2008 pages 75-76. ↑ Murphy, David The Arab Revolt 1916-1918, London: Osprey, 2008 page 75. ↑ Murphy, David The Arab Revolt 1916-1918, London: Osprey, 2008 page 76. ↑ ক খ Murphy, David The Arab Revolt 1916-1918, London: Osprey, 2008 pages 76-77. ↑ Murphy, David The Arab Revolt 1916-1918, London: Osprey, 2008 page 77. ↑ Murphy, David The Arab Revolt 1916-1918, London: Osprey, 2008 pages 77-79. ↑ Murphy, David The Arab Revolt 1916-1918, London: Osprey, 2008 page 79. Murphy, David The Arab Revolt 1916-18 Lawrence sets Arabia Ablaze, Osprey: London, 2008, আইএসবিএন ৯৭৮-১-৮৪৬০৩-৩৩৯-১. Korda, Michael, Hero: The Life and Legend of Lawrence of Arabia. আইএসবিএন ৯৭৮-০-০৬-১৭১২৬১-৬. Wallach, Janet (1997) Desert Queen: The Extraordinary Life of Gertrude Bell Adventurer, Adviser to Kings, Ally of Lawrence of Arabia. Phoenix/Orion Books. Wilson, Jeremy (1990). Lawrence of Arabia: The Authorized Biography of T.E. Lawrence. Atheneum.